Steppenwolf took a magic carpet ride in the 60s - and didn't even need the carpet. Whoever sitteth on this carpet and willeth in thought to be taken up and set down upon other site will, in the twinkling of an eye, be borne thither, be that place nearhand or distant many a day's journey and difficult to reach. Ah, that would be nice wouldn't it. Think of how you'd beat rush hour every day as you were born thither on your way to and from work. 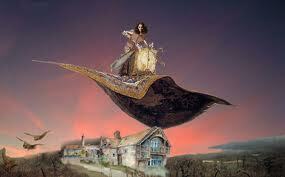 When Mrs D and I bought the house we live in about 11 years ago we had magic carpets. The house had wall-to-wall carpets. Not a speck of flooring other than the front hall, kitchen and bathrooms. And they smelled magical. Well, maybe magical isn't the right word. They smelled funny. Not funny ha-ha. No funny as in cat pee. The previous owners had a cat. One with incontinence apparently. We steam-cleaned those carpets at least once a year. The smell would go away...for a while. We had a cat. Then we got two more. Then the two more had five - which we quickly found homes for. Then one of the two got hit by a car and died. Then the original cat died of old age, with a little help from the Vet. The first carpet we ripped out was the basement...where the 5 cats were born and spent their first few weeks of life. Do all cat's have incontinence? And we put in one of those so-called floating floors. But it just laid there. It didn't float at all. Oh, well. Next came the main floor. We took out the wall-to-wall and replaced it with maple hardwood. Looked gorgeous. And any accidents - by now of which there were few - could simply be wiped up. Several years ago, we finished the job and replaced the wall-to-wall upstairs with the same flooring as on the main floor. And I guess that's the magic of carpet. You can always replace it! Head on over to We Work For Cheese where you can click on Nicky's linky thingy (that's not a euphemism) to see who's playing along with today's topic. A few years back I took over a friends apartment downtown. The carpets had a real um, lived in smell to them. Years of humidity and dirt and stuff. No cats though. I think the smell predated my friends having lived there. There's nothing like carpet for retaining odours. Our living room really smelled quite musty until we put down the hardwood floor. Someone had done a LOT of living in that room at one time. Ewwww. I lived in an apartment that had carpet everywhere... even the kitchen! Needless to say, with 2 kids, that carpet was a freakin' science experiment! Yeah, I'm totally with you on the hardwood floors. We've gotten rid of most of the carpet that came with the house. Not because of smell, but it had just worn out or broken down with age, so that it just ripped up. I thought this topic would be easier to write on. So far I've got nothing, but the day's not over yet. I wish we had a warmer climate, so we didn't need carpet all over the house. I remember the days before fitted carpet and it was drafty and miserable in winter. Now we have awful summers too! We had wall to wall carpet in our house and had it removed to find gorgeous hardwood floors underneath that yucky carpet. The floors were sanded and refinished and cleaned up beautifully considering they are the original douglas fur from 130 years ago. We have area rugs now and I like it much better than the wall to wall. The stairway has carpet and the upstairs as well. One day we'll get new hardwood for there as well. Or when we win the lottery. Either / or. A agree that hardwards are beautiful. Our main floor is all hardwoods but we did have new carpet laid wall to wall on the other two floors. I wouldn't want to live on other peoples carpet but I like new carpet in the bedroom areas and stairs. We have lots of stairs that go up and down 3 floors. There's nothing quite like real hardwood. When my parents removed the wall to wall from one of the houses we lived in, they found beautiful intact hardwood underneath. Exposing it transformed the house. Wow I didn't realize that my inner cat has been wreaking havoc with my life and underpants. And I envy that you have maple floors. Do you ever lick them to see if they taste sweet? I've lived in a house with carpet in the bathroom but kitchen? Can you imagine the odours that have sunk into that rug and the staff that's been splayed on it? Wow. Well, maybe if you follow this comment "thread" you'll be suitably inspired! You poor Brits. I'll bet there was lost of red carpet around London last week, eh? You're so lucky to have found hardwood under the carpet. We didn't and had to buy new flooring. Maybe you'll have similar luck upstairs? Sounds like carpet is very practical in yur case. I'd love to replace the carpeted stairs with wood. But stairs can be costly. We'll see. There's al;ays something to fix up when you're a home owner. That would save a significant expense, wouldn't it. I wish we had been as lucky. I agree. There's nothing quite like hardwood floors. Much easier to clean, too. Yes, I lick them every day. So far, no splinters in my tongue. And I have the cleanest floors in the city. I agree entirely. Get rid of those pissin' cats, man. I can see how you'd prefer carpet in that instance. You guts sure spent a bundle on commemorating the Queen's 60th anniversary. I'm just not in agreement with that. Well there is that...an aspect I hadn't thought of. Or "Catty Baba and the 40 Weaves"! You don't think maintaining the royal family to the lifestyle they're accustomed to contributes to that gloomy financial climate? I guess you can gather I'm not a big fan of the monarchy. Sorry about that. That's a side I hadn't thought of Babs. I guess my vitriol is more aimed at the canadian government more than the royals. They're spending millions on jubilee observances while their last budget is cutting where it really hurts people. Long live the Queen! Ha, ha. We finally agree! Ha ha! On that we definitely do! I love that song by Steppenwolf. And as much as I'd love to avoid all things traffic, this chick is way too scared of heights and flying to ever even consider taking a ride on a magic carpet! Ugh! Cat-Pee carpets = GAGS. You'd be a great one on the double ferris wheel!